Want to go ramp-walk stylish on a budget? Koovs is your one stop destination for finding all those amazing apparels that celebrities turn up wearing. Be it Bollywood or Hollywood stars, actors or actress, you will get all those famous celebrity looks at Koovs, at affordable prices. Dresses, suits, blazers, tops, tees, pants, jeans, shoes, bags, and all kinds of fashion accessories, Koovs offers it all. And to find the best of Koovs deals and discounts, there is Zingoy. Also, when you shop on Koovs using Zingoy, you can earn loads of cahsback on all your own and your friend’s shopping. Earnings from Koovs can be redeemed as vouchers or in Bank account. Made from cotton-lycra blend, Button and fly fastening, All over camo print, Five pockets & utility pockets, Side zippered hem, Slim fit. 100% Original & Authentic Products. OFFER PRICE: Rs. 1359. Use Promo code: EXTRA20. Offer Is Limited. KOOVS is a men’s wear collection designed by and sold exclusively on KOOVS. Designed in London, Made in India, KOOVS brings you directional and affordable fashion inspired by the catwalk, street style and celebrities. Keep visiting for regular new collections! Products are 100% Original & Authentic. Made from faux leather. Zip top closure. All over crocskin texture. Internal laptop divider. Front pocket. Single grab handle. Adjustable shoulder straps. 100% Original & Authentic Products. Available in Various Size, Designs & Colors. OFFER PRICE: Rs. 1359. Use Promo code: EXTRA20. Offer Is Limited. KOOVS is a men’s wear collection designed by and sold exclusively on KOOVS. Designed in London, Made in India, KOOVS brings you directional and affordable fashion inspired by the catwalk, street style and celebrities. Keep visiting for regular new collections! OFFER PRICE: Rs. 479. Use Promo code: EXTRA20. KOOVS is a men’s wear collection designed by and sold exclusively on KOOVS. Designed in London, Made in India, KOOVS brings you directional and affordable fashion inspired by the catwalk, street style and celebrities. Keep visiting for regular new collections! OFFER PRICE: Rs. 399. Use Promo code: EXTRA20. Upgrade your wardrobe with Koovs, a great online fashion hub which brings you apparels and fashion accessories inspired by international runways, trendy street styles, and celebrity looks. Be it for men or women, Koovs curates versatile and stylish clothing and accessories from Indian and international fashion brands and brings you 150 new products every week. Itching to go fashion shopping right away? Just checkout the amazing Koovs offers available on this page and you will not be able to rein in your shopaholic alter ego any longer. Shop all you want but don’t forget to make the most of the Koovs offers available here. Buying branded fashion is tempting but they come with big price tags. That’s why Koovs keeps announcing special Koovs coupons and discounts for its customers now and then. Be it women’s wear from popular brands, or men’s coats or jackets or beauty products; you will find Koovs coupons and offers on several categories and products, collected on this page. Now add to that the exclusive Koovs cashback offers brought to you by Zingoy. Yes, simply visit Koovs using the offer links given on this page and you will get some amazing Koovs cashback over and above the usual deals and discounts available. Thus, you save more than others by shopping via Zingoy. Also, if you like any Koovs coupon or offer given here, make a personal shopping link of it, and share it with your friends and family. If anyone buys using your Koovs Zingoy shopping link, you will get cashback on their purchase as well. Your cashback is tracked within 3 days. We offer higher Koovs cashback offers than other sites. We give you cashback on other’s purchases as well. 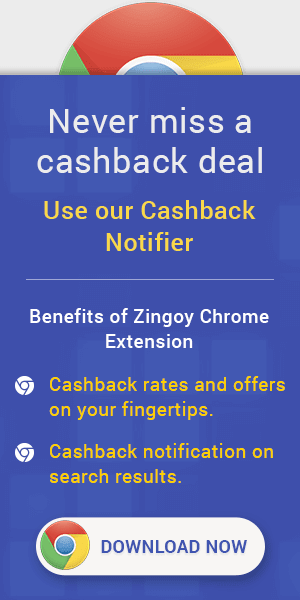 The Zingoy Chrome extension helps you never to forget your cashback while shopping. The Zingoy app brings you the latest Koovs offers on the go. Always enjoy the best Koovs cashback offers and save more with Zingoy. Buy Men's Jog Pants and get upto 60% discount on popular brands with Koovs cashback. Shop for Women's Trousers & Leggings and get upto 70% discount at Koovs with cashback from Zingoy. Koovs cashback offers on watches: Get upto 50% off on watches from top brand along with this Koovs offer get Koovs cashback through Zingoy. Koovs offers on men's fashion: Get upto 80% off on Bracelets & Wrist Bands, Earrings, Necklaces, Pin & Badges, Rings, Tie Pins and more along with Zingoy cashback. Koovs sunglasses offer: Upto 70% of Koovs sunglasses from the top brands along with the cashback. Koovs offers on women's product: Get upto 70% off on women's beauty products from Zingoy along with the cashback. Koovs cashback offers on bags & wallets: Get upto 70% off on bags and wallets from the top brands along with Koovs cashback offer.